The OSAA State Indoor Championship will be held at Norman Archery on February 25-26. 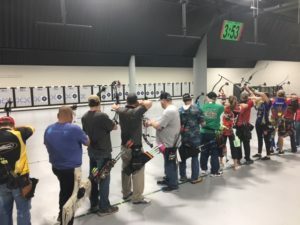 This will be an NFAA 600-round event, consisting of two separate rounds at an NFAA Indoor target (40 cm target, single spot or five-spot face). Each round will shoot 12 ends of five arrows each, with archers swapping targets top/bottom after 6 ends. Because of this, archers will need to sign up for two separate shooting times, either on the same or different days. Shooting lines are being scheduled at Friday at 6:00 pm, or Saturday/Sunday at 9:00 am and 12:00 noon , with possible expansion to a 3:00 pm line on Saturday if necessary. To qualify for the shoot, archers must hold membership with either the NFAA (National Field Archery Association) or USA Archery. In addition, archers must be members of the OSAA (Oklahoma State Archery Association). Memberships may be purchased at the event for the annual cost of $15 for the first family member, and $2 for each additional family member. The cost for the event is $15 for adults, $8 for youth, or $30 for a family. For more information and to sign up for the event, contact Rachel Clayton or Tige Mielke at Norman Archery – (405) 636-1415.